Discussion in 'Quotes Debunked' started by Jean-François, Aug 31, 2015. In my research work, I often see the following quite, attributed to Aldous Huxley in his seminal SciFi book Brave New World. But you won't find it there. You won't find it in any of his books. So the mystery remains. On a French forum I read someone making the hypothesis that this text could come from the back cover of Brave New World. A text that would summarize Huxley's theme. But it remains a hypothesis. I would love to see this one debunked. I also asked the same question in Quora here. I guess this thread has some intersection with this one "Huxley & Faabian Society"
The term "Perfect dictatorship" was popularized by Mario Vargas Llosa in 1990. I suspect the fake Huxley quote is a corruption of that. "Bread and circuses" (or bread and games; from Latin: panem et circenses) is metonymic for a superficial means of appeasement. In the case of politics, the phrase is used to describe the generation of public approval, not through exemplary or excellent public service or public policy, but through diversion; distraction; or the mere satisfaction of the immediate, shallow requirements of a populace, as an offered "palliative." Its originator, Juvenal, used the phrase to decry the selfishness of common people and their neglect of wider concerns. The phrase also implies the erosion or ignorance of civic duty amongst the concerns of the commoner. That seems very likely it. Huxley's actual words behind that "would love their servitude" were probably from a letter he wrote to George Orwell about 1984. Huxley, Aldous (2014-07-01). Brave New World . HarperCollins. Kindle Edition. Wow. I feel quite impressed by the sources you just pointed to so quickly and efficiently. This opens new horizons. Now what "stabilized" this quote that we can find everywhere on the net, including in documentaries, as a text from Brave New World? I feel quite interested in this phenomenon. I guess understanding it for this quote may lead to a more global understanding of the phenomenon. There is, of course, no reason why the new totalitarianisms should resemble the old. Government by clubs and firing squads, by artificial famine, mass imprisonment and mass deportation, is not merely inhumane (nobody cares much about that nowadays), it is demonstrably inefficient and in an age of advanced technology, inefficiency is the sin against the Holy Ghost. A really efficient totalitarian state would be one in which the all-powerful executive of political bosses and their army of managers control a population of slaves who do not have to be coerced, because they love their servitude. To make them love it is the task assigned, in present-day totalitarian states, to ministries of propaganda, news- paper editors and schoolteachers. But their methods are still crude and unscientific. The old Jesuits' boast that, if they were given the schooling of the child, they could answer for the man's religious opinions, was a product of wishful thinking. And the modern pedagogue is probably rather less efficient at conditioning his pupils' reflexes than were the reverend fathers who educated Voltaire. The greatest triumphs of propaganda have been accomplished, not by doing something, but by refraining from doing. Great is truth, but still greater, from a practical point of view, is silence about truth. By simply not mentioning certain subjects, by lowering what Mr. Churchill calls an "iron curtain" between the masses and such facts or arguments as the local political bosses regard as undesirable, totalitarian propagandists have influenced opinion much more effectively than they could have done by the most eloquent denunciations, the most compelling of logical rebuttals. But silence is not enough. If persecution, liquidation and the other symptoms of social friction are to be avoided, the positive sides of propaganda must be made as effective as the negative. The most important Manhattan Projects of the future will be vast government-sponsored enquiries into what the politicians and the participating scientists will call "the problem of happiness" -- in other words, the problem of making people love their servitude. Without economic security, the love of servitude cannot possibly come into existence; for the sake of brevity, I assume that the all-powerful executive and its managers will succeed in solving the problem of permanent security. But security tends very quickly to be taken for granted. Its achievement is merely a superficial, external revolution. The love of servitude cannot be established except as the result of a deep, personal revolution in human minds and bodies. He talked a lot about this topic, and give numerous interviews, and wrote many letters and essays - basically saying variants on the same thing. The fake quote could have arisen from any of them. The nature of psychological compulsion is such that those who act under constraint remain under the impression that they are acting on their own initiative. The victim of mind-manipulation does not know that he is a victim. To him, the walls of his prison are invisible, and he believes himself to be free. That he is not free is apparent only to other people. His servitude is strictly objective. The older dictators fell because they could never supply their subjects with enough bread, enough circuses, enough miracles and mysteries. Nor did they possess a really effective system of mind-manipulation. In the past, free-thinkers and revolutionaries were often the products of the most piously orthodox education. This is not surprising. The methods employed by orthodox educators were and still are extremely inefficient. Under a scientific dictator education will really work -- with the result that most men and women will grow up to love their servitude and will never dream of revolution. There seems to be no good reason why a thoroughly scientific dictatorship should ever be overthrown. I can't thank you enough for the amazing research work you have done and kindly shared. Thank you so much Mick. If I can help in any way on other topics here, I will. From all the material you provided I take on some core concepts, like the love for servitude, invisible walls, and the well known Roman concept of bread and games. I think the "quote" might actually come from the back cover of this book: http://www.syti.net/MeilleurDesMondes.html. It appears almost word for word on the page, and was probably copied from the back cover. Unfortunately, back cover isn't shown. I tried to order it out of curiosity but it can't be delivered to Belgium, apparently. Well, back cover was posted here: http://www.amazon.fr/Le-Meilleur-mondes-Aldous-Huxley/dp/2266023101 (scroll down). This is not where the "quote" appears. Maybe Preface? Introduction? yea thats what i got. Challenge, indictment, utopia world famous book, masterpiece of the early literature, Aldous Huxley has made one of the most lucid witnesses of our time. but chances are that web page is just copying the popular quote. although nice to note they don't attribute the words to the author. I don't see how this is the word for word quote, Deirdre? Quote questioned above is: ""The perfect dictatorship would have the appearance of democracy, a prison without walls in which the prisoners would not dream of escape. A system of slavery where, through consumption and entertainment, slaves would love their servitude." "Le "meilleur des mondes" décrit aussi ce que serait LA DICTATURE PARFAITE: une dictature qui AURAIT LES APPARENCES DE LA DÉMOCRATIE, UNE PRISON SANS MURS DONT LES PRISONNIERS NE SONGERAIENT PAS À S'ÉVADER. UN SYSTÈME D'ESCLAVAGE OÙ, GRÂCE À LA CONSOMMATION ET AU DIVERTISSEMENT, LES ESCLAVES "AURAIENT L'AMOUR DE LEUR SERVITUDE"..."
I sent an email to the webmaster of site sity.net and he says the text is just his description of the book, posted on that page, and was copy-pasted and spread as from Huxley. He also said another text from his website was later copy-pasted and attributed to Chomsky (from this page http://www.syti.net/Manipulations.html). Besides, the fact that "songeraient" was translated literally with "dream" (rather inappropriate) would indicate "amateur" translation towards English. i'm not understanding your question. Deirdre, Lily, thanks for your contribution. Everything points to the fact that the quote allocated to Huxley comes from some back cover, either in the French and English versions. Interesting to see how it becomes a "real" quote in the collective memory, as we see this quote everywhere on the net. Falsely allocated quotes (not to mention acts) proliferate on the Internet and shows in a live way how collective memory builds itself. Indeed. 'Songer' means 'dream', but 'songer à' means 'think of'. This alone is enough to determine that the quote attributed to Aldous Huxley is actually an amateur translation into English of the French blog entry found by Lily Joy. The perfect dictatorship would have the appearance of democracy, a prison without walls in which the prisoners would not dream of escape. A system of slavery where, through consumption and entertainment, slaves would love their servitude. I think Deirdre has the source that's closest to the original so far. Look at the differences in language usage, all in my opinion more like a native speaker: "A democracy", "not EVEN dream", "THE slaves". The other, more common, versions may have been translated into French and then back into English. The earliest crawl of that page by the Wayback machine was May 2012 (http://web.archive.org/web/20120522190641/http://www.egs.edu/library/aldous-huxley/biography/), although it could of course have been there earlier. The next question is who wrote that page, and was it original. This is not a translation into French of a text by Huxley, but a commentary about 'Le Meilleur des mondes', the French translation of Huxley's 'Brave New World'. It doesnt matter if the European Graduate School or the syti site wrote it first. The syti page does go back to 2006. The point is the OP quote seems to be from commentary about the book, which does closely follow Huxley's philosophy, rather than an exact quote from Huxley. PS. And it isnt an amateur translation in either direction. "wouldn't even dream of" in English means "think of". And i thought dream was rever. And think is penser. Either way both languages are saying the same thing. I don't think we've established the order here: how do we know which is a translation of the other? In favour of a French original is that the French versions date back further, and there are 16 pages of Google results including the exact quote, as opposed to a few for the English quote. However, it is more likely in general that a French speaker will find English text and translate to French, than that two separate English speakers will find French text and translate to English. It's interesting that the French on Lily Joy's syti page seems to contain a grammatical error: "grâce la consummation et au divertissement". Shouldn't that be "grâce à la..."? Almost all French pages maintain that error. There are other reliably dated quotes of it (sometimes explicitly citing that web page) dating back to at least 2005. That page is thus reliably attested as our oldest source so far. However, it does not seem proven yet (only asserted) that the quote on that page was original: it could be from an earlier source (e.g. the back of a book), another language, or even from Huxley himself. Such a source would of course be pre-2002, and thus unlikely to show up on Google. I went through all the back cover texts included on the page Deirdre referenced ("heres other editions if anyone wants to go through them. (back covers). http://www.noosfere.org/icarus/livres/Editionslivre.asp?NumItem=5029 "), and none had the quote or anything like it. 'Songer' used to mean either 'dream' or 'think' (the second sense being derived from the first one). Nowadays, it is only used in the form 'songer à' and only means 'think of'. The old meaning is still understood, though, because the noun 'songe' is still used as a synonym of 'rêve' ('dream') in a literary context. Hence a French translator may be tempted to translate 'songer à' into 'dream of' or 'even dream of', although that exaggerates the original meaning, while translating 'dream of' or 'even dream of' into 'songer à' would not be expected at all. This is a strong point in favour of a French origin to this false quote, in my opinion. I am a native French speaker and a professional EN>FR translator with many years of experience, by the way. I actually think the 2002 text (wanadoo.fr) is a paraphrase of some sentences as they appear in the French translation of 'Brave New World'. It would be interesting to find this French translation and the sentences that were paraphrased or summarised. As I see it, we have a group of sentences by Aldous Huxley in English, then the French translation, then the French paraphrase on the blog, then two or more translations into English of the French paraphrase, trying to pass for actual quotes. yea. i think the quote is a paraphrase of Huxleys general philosophy (as Mick has shown above) whether in English or French. I am a native French speaker and a professional EN>FR translator with many years of experience, by the way. yes i can tell you are a native french speaker. "He wouldnt dream of it" in english means "he would never think of doing it". Now i'm not saying the syti guy knows this of course. If he doesnt know 'dream of' means the same as 'ponder', then i agree he probably would have chosen a different word. How would you translate 'ponder'? But since you dont seem to understand the English use of the phrase "dream of", i think that helps show the syti guy may not know either. i read yesterday he has like 10 million 'followers', so i think its reasonable to assume that they spread the quote around and the EGS writer reused it himself. or the EGS guy reads syti's blog himself, since neither of them attribute the thoughts to Huxley as a direct quote. I guess thats pretty close!!! "The perfect dictatorship would have the appearance of democracy, a prison without walls in which the prisoners would not dream of escape. A system of slavery where, through consumption and entertainment, slaves would love their servitude." I signed up here to un-bunk this quote, but Fabinho Zooker has linked the reference of the said quote. Huxley did speak words to this effect & though verbatim is often lost when people reference audio visual (not written text), this is not a myth, this was a potential future Huxley laid out for western society. I love this interview & often refer to the words said, but again, verbatim is lost or tough to reference in less formal or impromptu settings. A slight misquote is surely best stated as such opposed to written off? Regards & thanks admins for this useful site. Glad to have stumbled into this while seeking the text to the video linked by Fabinho. I must be missing the point here. I don't hear those words at all in this video. Though some of the sentiment, for sure. HUXLEY: Well, to start with, I think this kind of dictatorship of the future, I think will be very unlike the dictatorships which we've been familiar with in the immediate past. I mean, take another book prophesying the future, which was a very remarkable book, George Orwell's "1984." 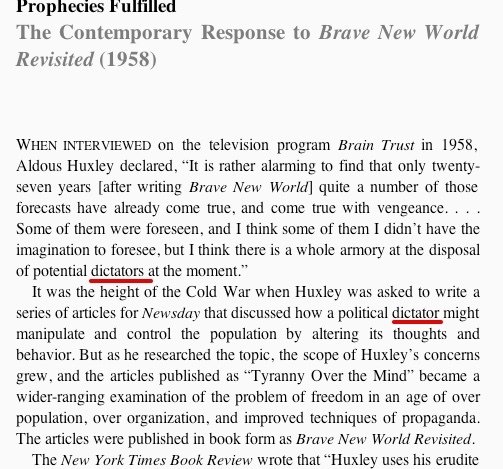 HUXLEY: But, if you want to preserve your power indefinitely, you have to get the consent of the ruled, and this they will do partly by drugs as I foresaw in "Brave New World," partly by these new techniques of propaganda. I mean, I think, this is the danger that actually people may be, in some ways, happy under the new regime, but that they will be happy in situations where they oughtn't to be happy.